On July 1997, the former British colony of Hong Kong officially became part of the People's Republic of China. But while the Communist leaders in Beijing would like to remember this day as a glorious moment in the history of the whole nation, today at 3pm thousands of Hong Kongers rallied to demand more democracy, in an open act of defiance against the central government. A large crowd gathered at Victoria Park, in front of Hong Kong Central Library. The protesters are now marching towards Central, the city's business and financial district. Half a million people are expected to take part in the rally. The demonstration was organised by Occupy Central with Love and Peace, a movement launched by Hong Kong professor Benny Tai Yiu-ting. The movement demands direct elections of Hong Kong's Chief Executive in 2017. At the end of last month, the Occupy Central movement organised an unofficial referendum. As the polls closed on Sunday, 787,767 Hong Kongers had cast their vote, 22% of the total number of registered voters. However, the central government in Beijing has condemned the referendum, calling it "illegal and invalid" since according to Hong Kong's Basic Law the city's authorities have no power to hold referendums. On Monday, the Hong Kong and Macao Affairs Office of the State Council released a statement, reiterating Beijing's position that the Chief Executive must "love the country and love Hong Kong", and that the pace of democratic development must be gradual and based on a broad consensus between the regional and central authorities. The statement denounced the organisers of Occupy Central, stating that they "pursue self-interests through breaching the rule of law, disturbing Hong Kong's social order and holding back the progress of universal suffrage". Hong Kong's Chief Secretary Carrie Lam stated that the process of reform of the election system cannot deviate from the Basic Law, though she pledged that the government should listen to the people. 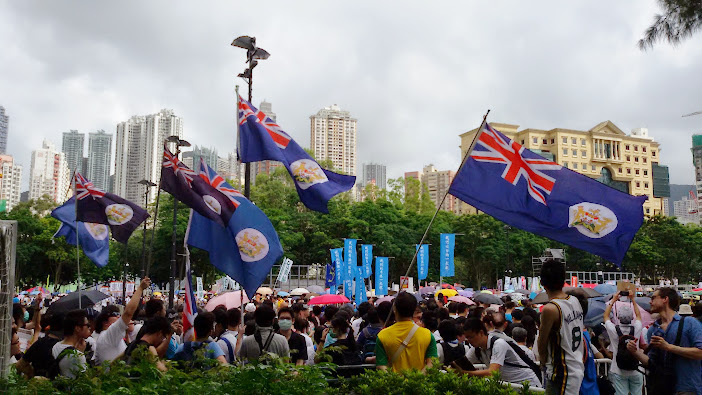 The "one country, two systems" model chosen by the leadership of the PRC to guarantee a smooth transition of Hong Kong to Communist rule has created growing tensions between the former British colony and the central government. After 1997 Beijing has put pressure on Hong Kong to conform to its own political standards. Although the rule of law remains basically intact, there have been signs of growing interference from Beijing in the media, the judicial system, and education. Beijing has repeatedly condemned the Occupy Central movement. Some officials even went so far as to suggest that the People's Liberation Army may intervene should the situation get out of control. If a state of emergency were declared, Article 18 of the Basic Law would provide a legal basis to apply the PRC's laws in Hong Kong. Only a few days before the pro-democracy referendum scheduled for June 22, the website of Occupy Central as well as those of pro-democracy media suffered massive hacking attacks that paralysed them for hours. Though there is no evidence of who was behind the attacks, many believe they were launched by Beijing or pro-Beijing groups. Occupy Central and many other movements show the desire of a large number of Hong Kong people to participate in the governance of their city. The closed and oligarchic system created by the Basic Law has made Hong Kong leaders unpopular and unaccountable to the people they are supposed to represent. But whether the central government is willing to yield to popular pressure, or whether it will resort to old methods of suppression, is still an open question.